The line is called En Root. These products were sent to me for review and I'm told they're available at Ulta, as well as LovelySkin, Aveyou, and Zappos websites. 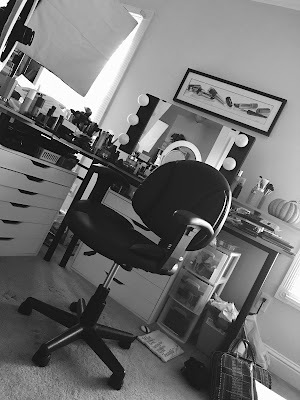 I also have some styling products to tell you about- but I'm saving that for another post. For now- here are my reviews on the shampoo, conditioner, and treatment mask I've been using in the shower! 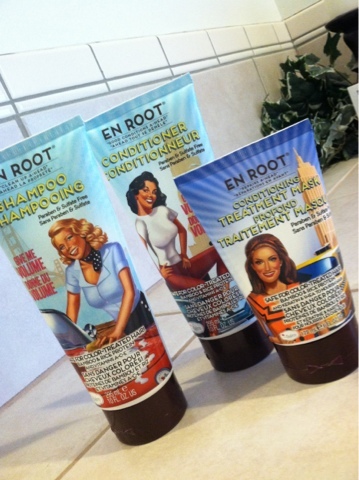 The Balm En Root Give Me Volume Shampoo & Conditioner ($15 each)- Pretty cute packaging, huh? These are sulfate & paraben free, and safe for color-treated hair. They're said to contain Vitamins A, C, and E, as well as bamboo and rice protein. Besides the volumizing formula I have, there are variations for different hair types- "Control My Curls", "Keep My Color", and "Moisturize My Hair". The scent is unlike other hair products I've tried and kind of hard to put my finger on... to me, it seems like a cross between floral and tropical. I'm getting a little bit of a coconut vibe, but it's subtle. As for how these have been performing- I've been getting lots of compliments on my hair in recent videos! People have been saying it's been looking healthy and shiny- and these are the products I've been using. At first, I thought this volumizing shampoo & conditioner made my hair VERY manageable while styling, but was possibly weighing my fine hair down a bit... like making it feel oily sooner than other kinds I've used. Then I thought maybe it was "operator error"- so I spent longer on the rinsing process in the shower- and I actually think it's helped! I still tend to wash my hair pretty much everyday- because I don't like to have any build-up of styling products. How much do these actually volumize my hair? I always feel like that comes down to how I style it- and I have never truly understood how a shampoo and conditioner alone can give my flat hair volume... but like I said, it does make my hair less "fly-away" and more manageable when I do style it. The Balm En Root Conditioning Treatment Mask ($15)- I've been using this in place of the regular conditioner once a week- leaving it on my hair as long as possible in the shower before rinsing it off. The directions say 10 minutes- but I doubt that I usually let it stay on that long. I put it on the bottom half of my hair- not near the roots. I feel like the regular conditioner is very nourishing to my hair to begin with- but this just kicks it up a notch. It contains keratin & shea and after using it consistently the past few weeks- I think it may be working even better than my Holy Grail deep conditioner- Tresemme Liquid Gold. If you're not too sure about going for an all new shampoo & conditioner but just want something to help out your heat-damaged hair- this product might be a good place to start. More reviews on The Balm hair products to come! I've been using their styling stuff as well, so I'll let you know how it compares to some of my long-time drugstore favorites. Have a great week everyone! Did my makeup in 5 minutes today for a Get Ready with Me video... oh the stress of speed makeup! Uploading it now. There is a March Madness bracket contest underway and you could win more than $150 worth of makeup! The details are here... and don't wait because I think the tournament starts tomorrow! You don't have to be a sports expert (Lord knows I'm not! )- just make your best guesses and have fun with it! The winner will be announced when the tournament is over. Spent much of yesterday evening sprawled out on the couch watching more episodes of Downton Abbey. You guys weren't kidding when you said season 2 was nuts!!! Thanks so much for the review! I'm super excited to try The Balm's new hair products! And that's great news that the line is available at Ulta. I will have to look for them the next time I'm there! Sulfate and paraben free?! That sounds amazing. Thank you for the post. I don't think I would have heard about this if I hadn't checked your blog. Great review! Can you please do a video of your mom cutting your hair when you do get it cut? Thanks! Have you tried the L'Oreal EverCreme Conditioner? I find it very hydrating. I use the EverStrong Thickening Shampoo with it. 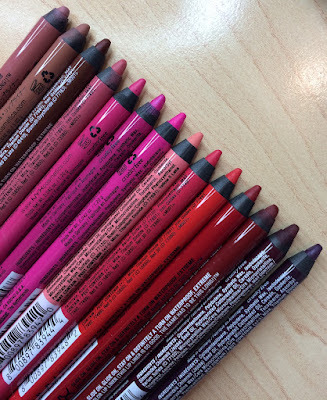 They're about $7 each at the drugstore and sulfate free. Thanks for sharing your review! My current hair routine involves sulfate free products too, all from Pro Naturals Moroccan argan oil, they're amazing. Looks like something I might have to give a try. I have curly, colored hair and it falls out like crazy. Anything you would recommend as far as products goes?